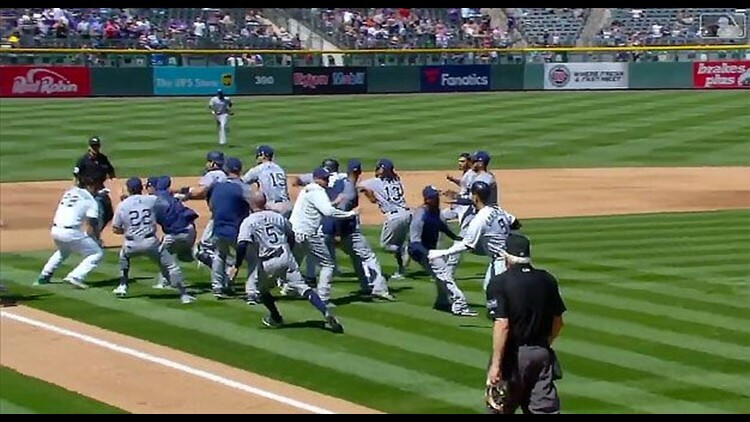 DENVER (AP) - Rockies star Nolan Arenado charged the mound after a fastball from Luis Perdomo sailed behind him, setting off a heated brawl that resulted in five ejections during a testy game in which Colorado beat the San Diego Padres 6-4 on Wednesday. Pedromo flung his glove at the rushing Arenado and missed. The big-hitting Arenado then threw a couple of huge punches at the backpedaling Perdomo, but didn't land anything squarely. Arenado's reaction in the third woke up the slumbering Colorado bats, with the Rockies scoring five times in the inning to take a lead it wouldn't relinquish. The tension between these two NL West teams started boiling a night earlier at Coors Field when Padres outfielder Manuel Margot got hit in the ribs by a pitch, putting him on the disabled list. The problems festered early on in the series finale, with Colorado's Trevor Story being plunked in the first and San Diego's Hunter Renfroe in the second. That set the stage for Arenado, who didn't take kindly to a pitch that nearly grazed his back. He immediately stormed after Perdomo, who threw his glove in self-defense. Arenado kept trying to punch the pitcher as the benches cleared and the relievers sprinted in from the bullpen. An incensed Arenado began screaming at Padres catcher A.J. Ellis, leading to San Diego bench coach Mark McGwire holding the All-Star third baseman back. Rockies starter German Marquez got involved by throwing a towel and Colorado outfielder Gerardo Parra looked as if he threw a punch. Once order was finally restored, the umpires met for several minutes before ejecting Perdomo, Ellis, Arenado, Marquez and Parra. Colorado erupted soon after the melee, sending nine hitters to the plate with most of the damage off reliever Buddy Baumann (0-1) when he took over for Perdomo. The big play was Tony Wolters' bases-loaded, two-run single that center fielder Franchy Cordero misplayed to allow another run to score. Cordero atoned with a solo homer as part of San Diego's three-run the sixth. Eric Hosmer hit his first homer as a member of the Padres in the eighth. Antonio Senzatela (1-1) struggled over three innings while filling in for Marquez. Wade Davis pitched a perfect ninth for his fifth save as the Rockies finished the homestand 2-4. Padres: Manager Andy Green said the hope is that Margot's ribs feel better in four or five days and he can take some swings. ... Cordero (groin) was reinstated Wednesday from DL after a rehab assignment at Triple-A El Paso. Rockies: OF Charlie Blackmon was out of the lineup for a second straight game with tightness in his right quad. "I'm feeling pretty good," Blackmon said before the game. The younger brother of Arenado hit a grand slam Tuesday night to lead Double-A Richmond over Colorado's affiliate, the Hartford Yard Goats. It was the first homer at the Double-A level for Jonah Arenado, a 16th-round pick by San Francisco in 2013. Padres: Open a four-game series against San Francisco. RHP Bryan Mitchell (0-1, 4.22 ERA) goes for San Diego, while the Giants will throw RHP Chris Stratton (0-1, 4.35). Rockies: Travel to Washington for a four-game set against Washington, with RHP Chad Bettis (1-0, 2.53) starting the opening game.